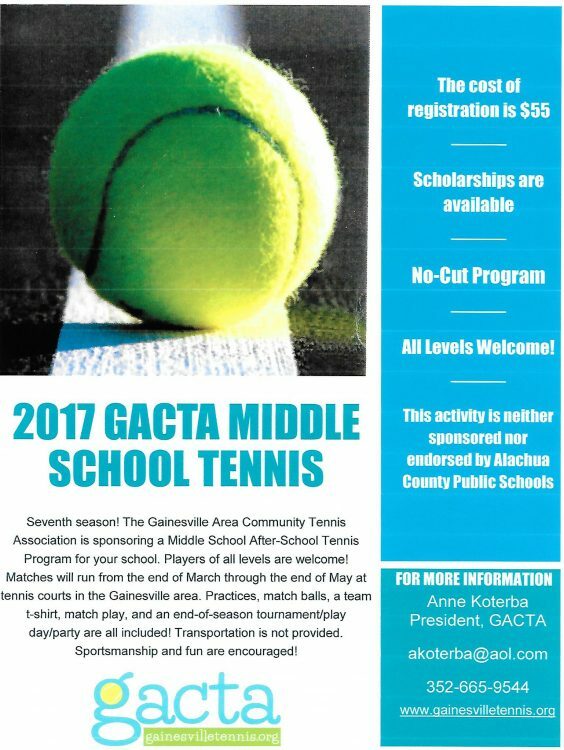 The seventh season of GACTA’s Middle School Tennis season is starting soon! This no-cut program welcomes players of all levels. Matches will run from late March through mid-May at tennis courts in the Gainesville area. Participating schools include: Lincoln, Westwood, Howard Bishop, Kanapaha, Oak Hall, Jordan Glen, Oak View and Queen of Peace.. If your school is not listed and you are interested in starting a program please contact Anne Koterba, program coordinator at akoterba@nullaol.com or call 352-665-9544.